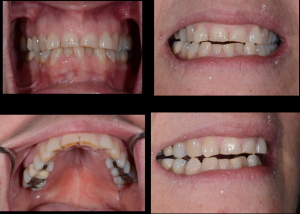 Every so often a patient enters my practice with a very interesting problem The case that is pictured above is a good example that had me stuck. Well, for those who know how I practice, I completed my comprehensive examination. It revealed absolutely no gum disease. What she thought was gum disease was a fistula associated with tooth #19. But the tooth only had a small filling and I saw no reason to believe that caries was the cause. I also noted that she had significant mobility on numbers 18 and 19. Note the presence of occlusal disease…note the severe wear. My biggest question was how she was able to wear down those front teeth…if she couldn’t get into the position to reach them. Well, I am lucky enough to have some friends in high places. I sent the photos and the records to twelve of my esteemed colleagues, members of my study club (that’s a plug for all study clubs). We kicked it around for a couple of days and came up with a few possibilities. Dentists are great for coming up with answers to tough technical problems. I’m not going to give you the answer. Most dentists love to solve these puzzles. All I can tell you is that the answer was Sherlockian. So I presented my case. She was amazed and very happy that she didn’t need laser surgery because she could only imagine how much that would have cost. I wondered how she would feel when I told her how much my restorative plan would cost. The patient’s bigger problem, after the fistula, wasn’t dental…it was financial. And it was real. It was real to me and it was her number one priority in life. She hadn’t worked in over two years. She stayed home taking care of a disabled husband. Things were difficult, like they are for many people these days. I am not throwing this problem out to the dental community to see what types of solutions come back. I am tired of all the “shoulds” I see on social media. We have a big problem in this country. Dentistry, with all of its technology and sophistication has the ability to fix just about anything these days…but the paradox is that less and less people are able to afford our advanced and innovative solutions. As a community, we are better than that. The dental community continues to get more and more fragmented. Everyone has their own agenda yet we have a bigger more global problem that is growing everyday. This is why there has to be a greater emphasis on leadership in our dental education. I don’t know what the answer for this lady is…but it will be some combination of using my technical skills, and my leadership, planning and listening skills. She doesn’t need a highly technical dentist to take care of her…just someone who cares enough about her. If your solution lacks a sense of compassion, please put that stuff on Facebook or the other sophisticated dental sites.